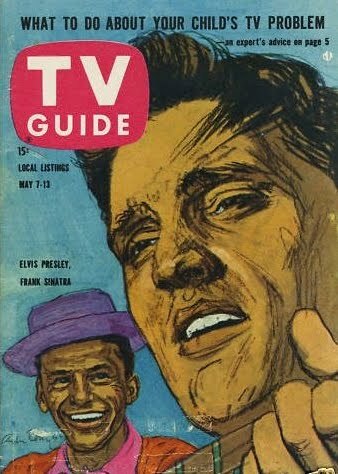 Fifty years ago tonight, on 12 May 1960 (a Thursday), ABC aired the Frank Sinatra television special, “Welcome Home Elvis,” Elvis’s first television appearance since returning from Germany in early March, where he been serving in the Army since late 1958. Actually the show was the fourth installment of The Frank Sinatra Timex Show, a series of mediocre television specials that Sinatra had made for Timex. Taped a few weeks earlier, on March 26, the show prominently featured other members of the so-called “rat pack,” including Sammy Davis Jr., Joey Bishop, and Peter Lawford, but missing Dean Martin. For trivia buffs the show is significant because it features Elvis singing a verse of the opening production number, “It’s Nice to Go Traveling,” the recording of which is available on the DVD releases of the show, but no official recording exists on record. Given that the show was an hour long, if the 1959–60 network television schedule available here is correct, it may have replaced The Untouchables at the 9:30 p.m. Eastern slot. Of interest now only as a museum piece, Elvis reportedly was paid $125,000 for his appearance on the program, an amount, according to the inflation calculator, equivalent to $895, 432 in current dollars. If you by chance have a copy of the DVD, please join me in watching it tonight, although be forewarned that Elvis appears on the show for only roughly six minutes. Elvis's first movie after leaving the Army, G. I. Blues, would be released slightly over six months later.